King of Pentacles (R) says to recognize when the choice to use “any means” to reach a goal has resulted in failure and this lack of fulfillment has brought feelings of doubt, dissatisfaction and weakness. This break in reality results in psychic danger as the vital connection with nature is severed and cut off from the rejuvenating flow. Focus now on releasing the people in your life who have a narrow – minded, inflexible, materialistic view on life. They may appear to be successful, respected and wealthy; but inwardly they are worried, tense, frustrated and afraid. A propensity toward ill health. Recurring material/ financial problems. A preoccupation with physical appearances or material or health matters. A conspicuous consumer, a man controlled by his possessions or a hypochondriac. Avoidance of responsibilities vs worrying too much about security. In the first position: You may be one of those called upon to carry an extra heavy load. In the second position: At one extreme, this suggests that your safety net is not strong for you at this time. At the other extreme, there may be too much support that you have relied on too heavily for your own independent development. 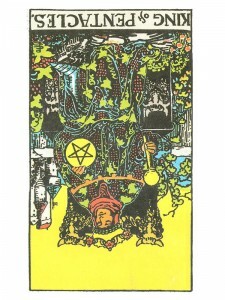 In the third position: Of course, you need to heed the King of Pentacles for your own benefit, but there are others who depend on you to take hold and take charge and to produce. In the fourth position: Distorted, this otherwise very healthy archetype can become a block instead of a blueprint/foundation for love and creativity. At one extreme, the figure is idolized and idealized and real life will find it hard to compete. At the other extreme, the figure is loathed and by extension either all men or all of certain types of men are not to be loved/trusted. In the fifth position: You may think adversely about this king or he about you. As an aspect of yourself, you may be thinking of getting out from under a responsibility. In the sixth position: If this is someone already in your life, there will be emotions to deal with here. The kind and depth will depend on who says no to whom. In the seventh position: You may be setting yourself up with too much to do – avoid taking on too much responsibility, especially without commensurate authority. In the eighth position: The king may be thrown for a loop. But it appears to be more personal than directed at your holdings or family, your responsibilities. Other possibilities are the extremes of either having taken on too much responsibility for the moment or not enough. In the ninth position: Your heart may be involved with this king and rather not be. Or, the opposite, this can be the symbol of your heart’s sadness over this person.